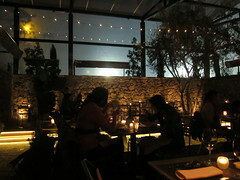 I was at Sadie last night with some good girlfriend-bloggers – about a week past its official opening. It was a belated discovery that the cocktails at Sadie, curated by Giovanni Martinez, are pretty tasty. Having known GiovanniÂ is a cocktail sleuth behind the bar thanks to his extensive travels, I was definitely not disappointed by the range and execution of the drink menu. Although the crust on the flatbreads were overcooked and tough, the main entrees were way better than I might expect from a Hollywood Boulevard spot. (I’m truly enjoying each time I’m surprised by my own neighborhood, by the way. )Â Dave Schmitâ€™s Scottish Salmon, Jidori Chicken (with delicious spÃ¤tzel) and Spinach Pasta were all enjoyed by my dinner companions and myself. But on those cocktails. My favorite of the night was the White Monk, made with white pepper & cardamom-infused Dolin Blanc Vermouth, silver tequila, Castilian bitters and Benedictine rinse. I love tequila, but this is the cocktail to erase all those college Jose Cuervo memories that have soured some drinkers towards tequila forever. It’s beautifully fragrant and extra smooth going down. But there’s nothing like a secret cocktail menu to spice up a stint at the supper club. Off Giovanni’s public list is “The Badger,” a unique drink made with reposado tequila, egg white and Miracle Mile bitters. But my favorite off this secret menu was definitely The Sadie Float. 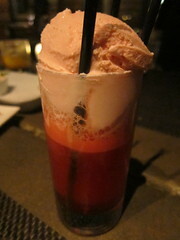 It’s made with Campari-flavored soda, Peychaud ice cream and, of course, Campari. Looking at it, you’d think it was the typical, sweet cocktail made sweeter by the fact that it also has ice cream. Once you taste it, you discover pure Italian genius. It’s fizzy, slightly bitter and yet creamy. And it’s pure heaven. Hint: Don’t get it if you don’t like Campari. But you’d be committing a crime if you were to leave Sadie without having dessert. Their Peanut Butter & Jelly Ice Cream Sandwich is out of this world, as is their Black & White, or flourless chocolate cake complete with white chocolate ice cream on the side. 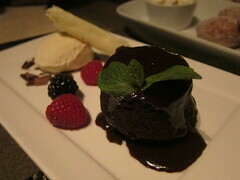 The “clutch” dessert, however,Â at this spot is the Homemade Donuts and Irish Coffee Cream. 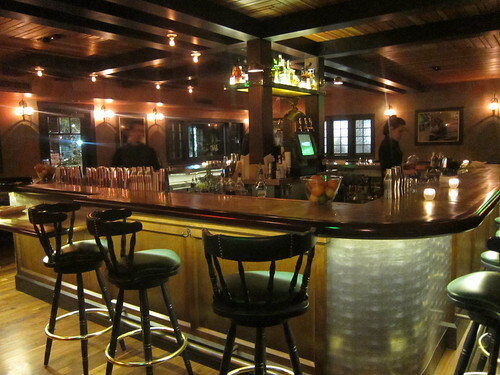 You won’t visit Sadie for the bargain, but like most places in Hollywood, for the atmosphere which thankfully is not a detractor from the food and cocktails, but instead an enhancement. The food has the potential to stand all on its own while the cocktails make Sadie a destination. Forget Les Deux I, II and IX; hopefully Sadie, with its multi-faceted interior and approach, is here to stay. 1638 N. Las Palmas Ave. This entry was posted in cocktails, Food, Hollywood and tagged @sadierestaurant, American, campari, chicken, cocktails, Dinner, drinks, float, Hollywood, Hollywood Blvd, ice cream float, liquor, pasta, patio, Sadie, salmon, secret menu, supper club. Bookmark the permalink.